These old computers run just fine with the most modern Ubuntu GNU-Linux software installed on them! The 5th grade math teacher, Lacee Phillips, will be using those computers to allow students to perform drills on the Khan math academy, among other things. Today, we also moved the notebook computers from their temporary home at the Law Office of Albert G. Stoll to their permanent home at the Creative Arts Charter School, another public charter school in San Francisco’s Western Addition neighborhood. There were 19 notebook computers and 2 desktop computers that had been donated to Partimus by Intuit, but we had to have the shipment delivered to Al Stoll’s law office due to the fact that we were unsure when we were notified of the donation in the spring whether school would be in session or not when the machines arrived. Partimus Board of Directors member Christian Einfeldt was in the middle of a deposition (he’s a lawyer), when Al’s office manager came into the deposition with a note that the computers had arrived. It was a contention deposition that Al’s office had been trying to set up for more than one year, but when Christian heard that the computers had arrived, he was elated, and interrupted the deposition to briefly go to the FedEx truck to review the computers and sign off of the FedEx delivery slip to get the computers delivered. Exciting! Fortunately, opposing counsel and the deponent were gracious about the interruption, but the deposition was later suspended so that it could be completed on another day (not because of the interruption). The computer delivery sparked some interest among the hard-core trial lawyers and their staff who occupy the suite where the computers were delivered, because there were two big boxes with machines, and two monitors in bubble wrap sitting right in the middle of the floor of the office. Pictures of the boxes can be seen here. Today, Sunday 2012.8.5, Partimus Board Member Elizabeth Krumbach picked up Christian Einfeldt at the KIPP school, where they grabbed a cart to move the boxes, and drove to the Pier 39 area of San Francisco, where Al’s office is located. They loaded the boxes into Elizabeth’s small coup. The boxes barely fit. Elizabeth and Christian then drove the boxes over to the Creative Arts Charter school, and picked up another computer for a non-profit dedicated to stopping human trafficking in California. They dropped off that computer, and then went over to the KIPP school again to drop off the cart and to set up the Ubuntu GNU-Linux computer network shown in the picture above. They got the network set up just 5 minutes before they had to be out of the building and the school alarm was set. The work went right down to the wire. And, of course, Elizabeth and Christian enjoyed the Partimus Pizza special, broccoli and pineapple pizza from Extreme Pizza on Fillmore and Sutter Street. Now, Elizabeth Krumbach is already in the process of investigating the notebook computers, shown here on her Flickr page. 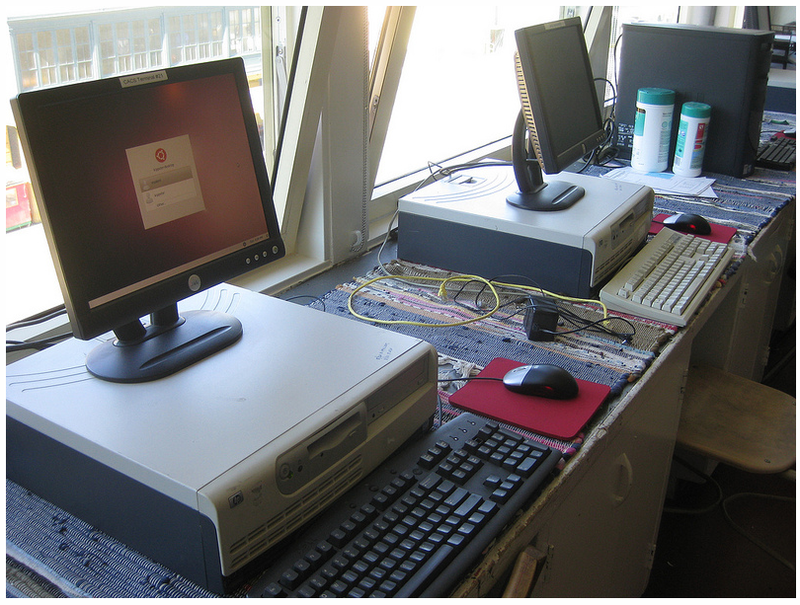 The next step is for Partimus core volunteer emeritus James Howard to pour over these machines to prep them for a mass install with Ubuntu and eventual addition to the CACS network. These are the notebook computers that were recently donated by Intuit. Thanks Intuit! It was a great day with a sense of real accomplishment. We have been waiting for these notebook computers for a long time, due to the fact that the Creative Arts Charter School (CACS) had suffered a fire on 2011.12.22, and so CACS has no room for an independent computer lab, at least for the remainder of 2012. CACS had to cram students from 2 buildings into one building, so they had to close the computer lab and use it for a classroom. 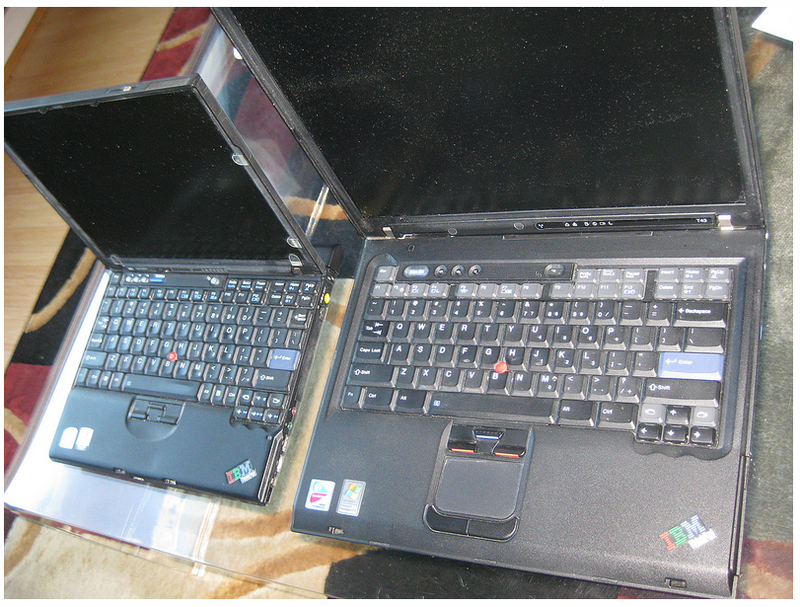 That is why the notebook computers were so crucial; they can be used in a classroom, due to the fact that they are small, and it is not necessary to run wires all over the place to get them working. So thanks again to Intuit for this wonderful donation of notebook computers; it will make a huge difference in the lives of the teachers and kids using them! This was written by Christian Einfeldt. Posted on Monday, August 6, 2012, at 1:36 am. Filed under News. Tagged CACS, computers in math class, depositions interrupted, Elizabeth Krumbach, Intuit, James Howard, kipp, Lacee Phillips, Pizza party, Ubuntu. Bookmark the permalink. Follow comments here with the RSS feed. Post a comment or leave a trackback. ‹ Advance peek at the Intuit notebook donation!